Visual (Default) Uses buttons and a step-by-step process to generate new menus or prices lists and then add sections, individual items and options. Show me an example. 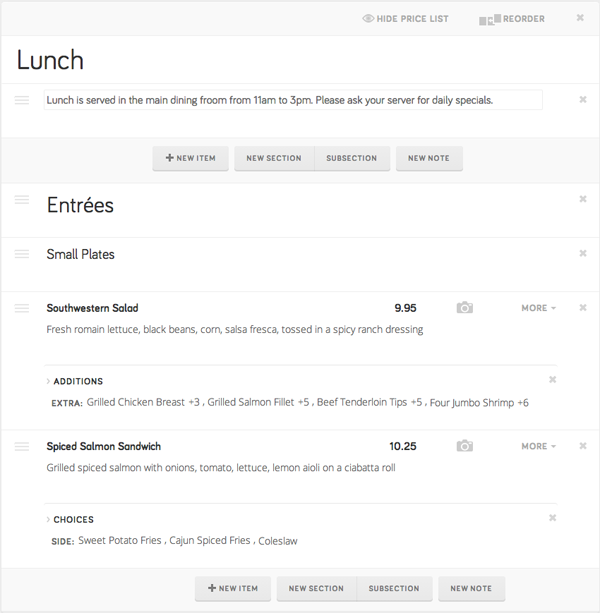 Text Lets users enter text directly to create different elements of a menu or price list using specifically defined symbols. Show me an example. Because Visual Mode is the default, you'll need to manually switch to Text Mode if you want to use it. Click Get Found, and then click Manage. 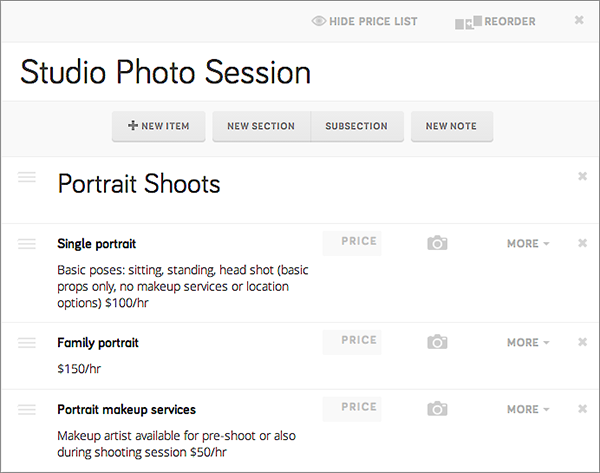 In the left-hand column, click Menus or Price Lists. 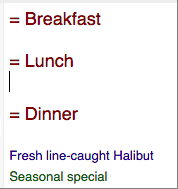 In the right-hand column, click on the menu or price list you want to edit and then click Switch To Text Mode. 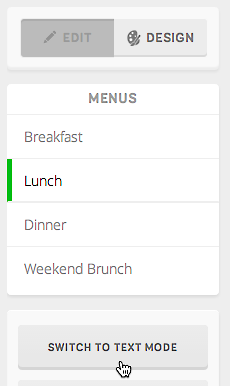 Text mode displays all of your menus or price lists, each of which begins with =. Click at the end of the line just above where you want to add text and press Enter/Return. Begin entering the text for your menu or price list. Use the Key to Text Mode Entries table below as a guide for entering the special text and symbols used to create sections, subsections, choices and options. 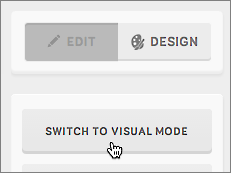 To see how text mode's special text and symbols display, click Switch To Visual Mode. Toggle between the modes (text on left, visual on right) as you work until you get comfortable working in text mode. If you need to rearrange items while in text mode, you can copy the text and paste it into a new spot within the menu or price list. Once you're done, click Save Changes at the top of the page. NOTE: If you enter text without the proceeding %, it gets treated as an Item/Service Name. To see how this actually works, we have some examples for you. % Lunch is served in the main dining from from 11am to 3pm. Please ask your server for daily specials.